First, we considered only swimming spots that were inside some sort of hole in the earth. That is, our swimming holes had to be substantially surrounded by rock. So somewhere like Idaho’s Redfish Lake, which a popular travel magazine named as one of their best swimming holes, wouldn’t count for us because, really, it’s just a regular lake. Second, we decided to count only naturally occurring swimming holes. Sadly, this eliminated a very cool hidden swimming spot in Mexico that was created by a giant bomb — check back for our post on that later. Finally, we only considered swimming holes that offered temperate waters. Because, well, we are cold water wimps. Spain’s wonderful, meadow-surrounded Playa del Gulpiyuri is unfortunately ruled out of contention on this count. So what swimming holes made the cut? Read on . . . . The vast majority of Isla Holbox—an island north of Cancun off of Mexico’s Yucatan Peninsula—is an untouched nature preserve. Only the eastern most tip of the island is permanently inhabited. That’s where you’ll find the few square blocks of sandy streets that make up Holbox town. Most residents get around by walking barefoot. (The island has no rocks). Those few who drive pilot golf carts, not cars. Most vacationers flying into Cancun International Airport head directly to the glamorous shopping, high-rise beach resorts, bustling nightlife and traffic-filled streets found in Cancun’s Zona Hotelera. But there’s a nearby destination that includes none of that — but so much more. On Isla Holbox, an island north of Mexico’s Yucatan Peninsula, the shopping consists of a few shacks peddling jewelry, sandals, beer and the like. The island’s handful of hotels are small and don’t rise much higher than palm trees. The nightlife revolves around quiet beach bars where barefoot patrons are as likely to sit on swings or hammocks as they are on seats. As for the traffic, the island has no cars. However, we’ve been told that on occasion two of the island’s golf cart taxis meet up at an intersection. Our captain is yelling while gesturing to us to hurry overboard. Overcome by his sense of urgency, we jump flippers first off our boat into warm Caribbean waters. There’s a second of disorientation. Then the water bubbles created by our fall dissipate and the view out of our snorkel mask clears. And what a view it is: the wide open mouth of the world’s largest fish heading directly towards us. We are swimming with whale sharks off the coast of Isla Holbox, Mexico. Our trip was all arranged using Pay With Points, available through American Express Travel. Our challenge from American Express: to turn 150,000 Membership Rewards Points into a trip for two with WOW factor. Being underwater, staring directly into the enormous mouth of a whale shark an arm’s length away—that’s a memory-making travel experience with no shortage of WOW. What kind of cool travel getaway can you go on with 150,000 Membership Reward points? How about a romantic trip for you and yours truly to a tropical car-free island in Mexico where you go swimming with the world’s largest fish and bring back video of your underwater adventures and top it off with a Mexican feast and tequila distillery tour. That’s the trip Spot Cool Stuff chose when American Express challenged us to create a WOW factor getaway with 150,000 Membership Rewards points. With Pay With Points, available through American Express Travel, you aren’t limited to exchanging points for airplane tickets. 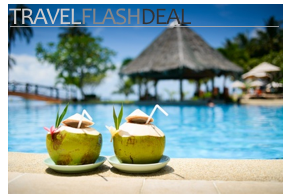 You can also book hotels, resorts, rental cars, cruises and vacation packages. And you aren’t even limited to those. Link your Membership Rewards account to Amazon.com and you can use your points to buy anything that the internet retail metasite sells. Or you can select deals on the shopAmex website. And even those aren’t your only options. How about meals at any restaurant bookable through Open Table? Or dining, music, and theater rewards available specifically for American Express charge cardmembers? Or movie tickets? Or mystery trips? So many choices. So little time. In the end, our travel editors decided to use Pay With Points available through American Express Travel to journey to Mexico’s Isla Holbox. Over the next week, we’ll publish reviews of our experience. Click below to check those out . . . Swimming With Whale Sharks published! Exploring Isla Holbox: The Other Side of Cancun published! Stay at La Nubes de Holbox Hotel published! Quiz question: What’s the difference between a cave and a cavern? In common usage the two terms are mostly interchangeable. But, technically, there’s a difference. Pretty much any underground chamber qualifies as a cave. To be a cavern a cave must 1) have formed naturally out of rock; and 2) be able to produce speleothems, which are those icicle-shaped mineral deposits created by dripping water. Hostelbookers is one of Spot Cool Stuff’s favorite websites for booking cheap hostels, inexpensive inns and budget hotels. In addition to offering a wide selection of accommodations (most of which aren’t available on sites like Travelocity or Hotels.com), what’s cool about Hostelbookers is their extensive database of customers reviews—they’re a huge help in separating out those hostels that are high value from those that are cheap for a reason. Hostelbookers reviewers grade properties on eight criteria: atmosphere, location, facilities, fun, staff, cleanliness, safety and value. An American Werewolf in . . . Cozumel? This January the Carnival Liberty will set sail on a special Fangs and Fur Cruise. But if you imagine this is an opportunity for you and your four-legged companion to take to the high seas—a sort of Rover + You + the Love Boat—you are off. Way off. The fangs in question belong to a vampire. The fur belongs to a werewolf. And the cruise’s target audience is literally literary—it is for aspiring authors of the gothic genre.